Unlike previous treatments for infections, which included poisons such as strychnine, antibiotics were labelled "magic bullets": drugs which targeted disease without harming the host. Antibiotics are not effective in viral, fungal and other nonbacterial infections, and individual antibiotics vary widely in their effectiveness on various types of bacteria. Some specific antibiotics target either gram-negative or gram-positive bacteria, and others are more wide-spectrum antibiotics. The effectiveness of individual antibiotics varies with the location of the infection and the ability of the antibiotic to reach this site. Oral antibiotics are the simplest approach when effective, with intravenous antibiotics reserved for more serious cases. Antibiotics may sometimes be administered topically, as with eyedrops or ointments. The first effective antibiotic discovered was penicillin. French physician Ernest Duchesne noted in his 1896 thesis that certain Penicillium molds killed bacteria. Duchesne died within a few years, and his research was forgotten for a generation, until an accident intervened. Alexander Fleming had been culturing bacteria on agar plates, one of which was ruined by an accidental fungal contamination. Rather than discarding the contaminated plate, Fleming noticed a clear zone surrounding the colony of mold. Having previously studied the ability of the enzyme lysozyme to kill bacteria, Fleming realized that the mold was secreting something that stopped bacterial growth. He knew that this substance might have enormous utility to medicine. Although he was unable to purify the compound (the beta-lactam ring in the penicillin molecule was not stable under the purification methods he tried), he reported it in the scientific literature. 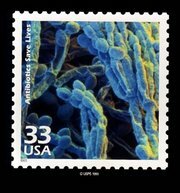 Since the mold was of the genus Penicillium, he named this compound penicillin. In the 1930s German scientists investigated the antibacterial properties of certain dyes. One of these was a sulfonamide, prontosil, which was used to treat infections in humans, where its effect was found to be due to its conversion in the host to the active form, sulfanilimide. By today's more broad definition, this would likely qualify as the first successful use of an oral antibiotic. During the same era, Rene Dubos isolated tyrothricin, an antibiotic used topically for skin infections, from soil bacteria.